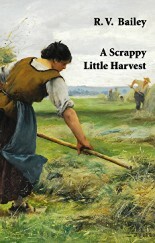 The title of R. V. Bailey’s fifth collection, A Scrappy Little Harvest, can be misleading as her poems explore her preoccupations with large themes – language and meaning, faith and truth, illness and death, love and loss, music and life in the countryside and more. Her themes are universal, but typically presented in a style that is characterised by her insight, wit, humour and understatement. Her tone is considered and quiet, and as we immerse ourselves in her poems, they build slowly but surely a world that enriches us. As Carol Anne Duffy points out, ‘R.V. Bailey’s poems brim with warmth, decency, humour and intelligence – documents from an England we would all love to live in if we could only find it.’ It is a joy to discover such a world in Bailey’s poems, testifying to the generosity of her imagination, the persistence of her struggle to be true to herself and her calling: ‘Seduced by poetry and people / And the fragile vigorous past’ (“A poem for Peter Scupham” – words for her friend that also reflect her own preferences). Bailey was born and brought up in Whitley Bay, Northumberland, educated at Cambridge and Oxford; she lives in Gloucestershire. For most of her life she has been an academic, ending her professional career as Deputy Dean of Humanities at the University of the West of England. She has co-edited two major poetry anthologies – A Speaking Silence: Contemporary Quaker Poetry (with Stevie Krayer) and The Book of Love & Loss (with June Hall). With U. A. Fanthorpe she wrote From Me To You, and was the extra voice in Fanthorpe’s poetry readings. Together they read throughout the UK and overseas, jointly led poetry courses and adjudicated poetry competitions. That will outlast us all. A hot night, like this one. A sudden impulse, obeyed. And half-an-hour’s silence in a car, on top of a hill. To get up high on a hill, from the stifling bowl of the town. I suppose we ought to be getting back, and I drove you home. Why we’d gone up the hill that night, and all that we didn’t say. You did not think so. and alone, and nothing about it is safe. To plant the flowers on your grave? There’s nothing very special about mine. Such a lofty and disinterested view of learning. Perfect pitch in the art of being human. ‘Wide as a smile, warm as teacake, white as a cloud, / Crammed with stories and puzzles and dreams. The tree from the wood. The poem “The readiness is all” reminds me of Shakespeare’s ‘ripeness is all’ (King Lear, Act 5, Scene 2, ‘Men must endure / Their going hence even as their coming hither. / Ripeness is all.’). The last poem in this collection, “Words, words, words”, brings together many of her themes – the inadequacy of language, the redeeming power of love, nature and life in the country. ‘Words have lost their piquancy, / They’re treacherous as weather…’ One is left in no doubt of her vocation.